I suddenly found myself without plans today, so I figured it as good a time as any to finally bid my winter duds farewell. I've been putting it off for the past couple weeks as the weather has shifted between feeling like summer one day and fall the next. But, one sight of my metallic flip flops this morning and I couldn't resist. There's always something about catching a glimpse of one of my seasonal favorites that makes the task of switching my closet over seem less daunting (if you come from a four-season locale, you know what I mean). I work Turquoise into a lot of what I wear in the warm weather. It reminds me of being near the ocean. endless rainbow of flip flop options. Bath & Bodyworks' Exotic Coconut once the temperature tops 80 degrees. 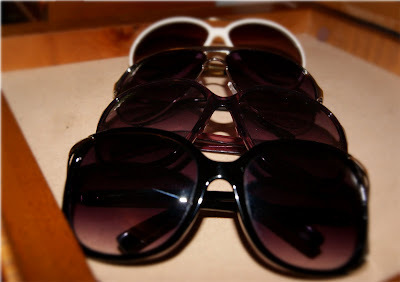 pair of shades. It hasn't happened yet. GOOD-BYE Winter it is :-). Where's the yellow ~ just kidding :-). It is for this season .... added yellow soft leather hobo, peep-toe kitten heels and green/yellow wedges to spring/summer collection. Looking through my closet this is a first - coral for a while and last year was all shades of green :-).